Hand picking is the best way to make a sizable dent in the Japanese beetle infestation immediately--especially on rose bushes. Either knock them off into a jar of soapy water or grab them and squish them between your fingers or with tweezers of some sort. Whatever method you use, do it early in the morning when the beetles still have dew on their wings and they are less likely to fly or midday when they are sluggish in the heat and sun. Susan Schofield, in Fine Gardening Magazine, describes a way to make hand-picking more efficient. She inserts a funnel in the top of a used soda can, and then as she spots beetles she knocks them into the funnel and they slide down into the can. When she is finished, she tapes the can and throws it into the trash. For folks who recycle soda cans the system should still work. 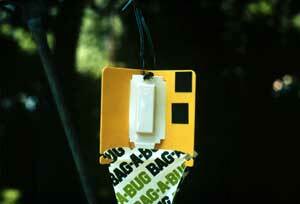 Japanese beetle bag traps are too effective for use in typical residential landscapes. Their pheromone lure attracts beetles from as far away as 500 yards, actually attracting unwanted beetles from all the neighbors’ yards. Since all the beetles attracted by the trap do not fall into it, you risk inadvertently increasing their population in your yard. Only if you are able to set out beetle bags a distance from your property-- in a nearby park, cemetery, corporate campus, shopping mall or other planted area--will they effectively reduce your Japanese beetle population by luring beetles away from your yard.